I needed a cup for Jesse to take on the go and Nuby had a cool colorful one that he liked. I choose the Nuby Pop-up cup as it had features I liked. The Nuby Pop-up features a pop-up sipper that is easy for Jesse to open and I like that it keeps the cup clean when closed. Like all Nuby cups it is dishwasher safe and durable. The Nuby Pop-up cup comes in many cool colors also,check the colors out here .The Gator grips ensures a comfortable and secure grasp for you child. Jesse really enjoys using his new Nuby cup and you can buy one for your child also at Walmart,Target,Amazon,and www.buybabydirect.com . "These opinions are my own and I received a product from Nuby as a Nuby Mommy blogger." Jesse and Kodi moved into Tyler and Dillon's old room as their room was too small for them to have big boy beds. They are loving sleeping in big beds and they did not fall out of bed last night. Their room turned into a playroom and they have been up there all day discovering old toys they have not played with in a while. I have three boys and a husband who are know to make messes and they never clean them up. I always have a dirty sink in my bathroom, so when I received a bottle of Soft Scrub Total all purpose bath & kitchen cleanser the other day from Purex Insiders,I knew it would be put to good use. I love that Soft Scrub has superior cleaning power yet will not scratch surfaces. The new improved formula has more whitening power and less residue,for better rinsing. Soft Scrub also is lemon scented to make the cleaning job smell great. Here is a picture of my sink that is used all day by my boys. The spots are soap that gets all over the sink. I did a close up to show you the mess and the sink is white,not yellow. Soft Scrub has provided me with 2 coupons for free Soft Scrub Total all purpose bath and kitchen cleanser to give away to my readers. Just enter the rafflecopter form below. I love hanging out with friends and having a party. My mom's group was having a Valentine's playdate. So I took the opportunity to tell them about Premama prenatal vitamins. Most of the moms were nursing babies and were still planning to have more babies. They were happy to take many samples of Premama prenatal vitamin home with them. Premama prenatal vitamins are great for pregnancy and nursing moms. I told all the moms about how Premama is a taste-free powder vitamin that mixes great in any drink like juice or even milk. The moms loved that it was not a big pill to swallow as when you have pregnancy sickness it is hard to get a big pill down. The moms loved that Premama has folic acid, iron, and DHA in it and ginger, B6 and magnesium to help with nausea. We exchanged presents at our party and ate wonderful snacks while the kids played. "These opinions are my own and I was sent product from Mommy Parties to share with others." Purex, Honey Bunches of Oats, and Outrigger Hotels and Resorts are joining forces to send one lucky winner on a tropical paradise vacation to Outrigger Waikiki on the Beach! Over $13,000 in prizes! The only thing Cupid loves more than the cleaning power of Purex is a fresh fragrance. Search through Purex.com and find Cupid’s heart for a chance to win $50! Win big with the enchanting, fresh scent of Purex detergent plus Fabric Softener with Crystals fragrance. Click to sign up for a chance to win over $1,000 in prizes! Let’s welcome the newest member to the Purex Crystals’ family: Purex Crystals for Baby! A great new scent for the little ones. My family has discovered a great new yummy cereal. My boys already love Post Honey Bunches of Oats and when we tried Post Honey Bunches of Oats Tropical Blends we loved it. My box of this wonderful cereal arrived from Purex insiders on a dreary day. The box lifted lifted my spirits with it's tropical design and the taste took my taste buds away to a tropical island. Later on I will tell you how you can enter a contest to go on a tropical vacation. Post Honey Bunches of Oats Tropical Blends is made with 10 grams of whole grain and has 9 essential vitamins and minerals including 60% daily value of iron. As a mom.I love that it has only 6 grams of sugar and 120 calories per serving. The taste of this cereal is wonderful with crispy mango flavored flakes combined with real coconut shavings and coconut flavored granola clusters. Just look at my bowl of cereal-yum! Now for some fun! 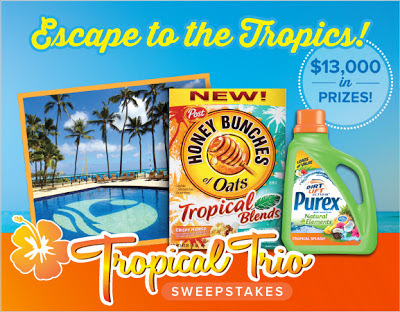 The Purex brand is teaming up with Honey Bunches of Oats and Outrigger Hotels and Resorts to launch a great prize giveaway: The 2013 Tropical Trio Sweepstakes. One lucky winner will be sent on a tropical paradise vacation to Outrigger Waikiki on the beach. The winner will receive a four-night stay at www.Outrigger.com on the Beach for two people.
. 100 winners will receive coupons for free Purex Natural Elements Tropical Splash detergent & Honey Bunches of Oats Tropical Blends. Honey Bunches of Oats Tropical Blends has provided me with two coupons for a free box of cereal to give to one of my readers. Just enter on the Rafflecopter form below and good luck! "Post provided a free sample of their Honey Bunches of Oats Tropical blends so I could review them. However,all of the opinions expressed here are my own." I was sent some coupons from Bzzagent to try some low carb yogurt and greek yogurt made by Kroger which also owns Smiths grocery stores.I know a lot of friends who are on low carb diets and are always looking for food that fits their diet. I can tell them that now they can have yogurt and milk again as Kroger makes low carb milk and yogurt that tastes good. They also make low carb greek yogurt. I love greek yogurt as it is high in protein. So I bought the Kroger pineapple mango flavor greek yogurt to try. I love that it has stevia in it for sweetness as stevia is natural and not chemical like other sweeteners. The taste was quite good for a low carb product. The Kroger low carb yogurts came in many yummy flavors,so the next time you are at at Smiths check out this yummy yogurt. I also have coupons to give away. "These opinions are my own and I was given coupons from Bzzagent to purchase the yogurt to write my review."